The Algerian town of Ain Sefra is known as the Gateway to the Sahara, and it’s not the kind of place that gets associated with winter weather. So imagine the surprise of amateur photographer Karim Bouchetata when he awoke to see his picturesque town and the surrounding sand dunes covered in a blanket of snow. Thankfully for us, he grabbed his camera. Ain Sefra is located in northwest Algeria about 220 miles (350 km) south of the Mediterranean sea, and right on the northern hub of the Sahara desert. Bouchetata said he was “stunned” to see snow falling in the desert, telling Gizmodo it’s “an exceptionally rare occurrence.” This kind of thing happens about once every 10 years or so. The last major snowfall—if it can be called that—to hit Ain Sefra was in February 1979 when it snowed for a whopping 30 minutes. Subsequent dustings of snow also appeared in 2005 and 2012. The desert town is located about 1,000 meters above sea level, and is surrounded by the Atlas Mountains. 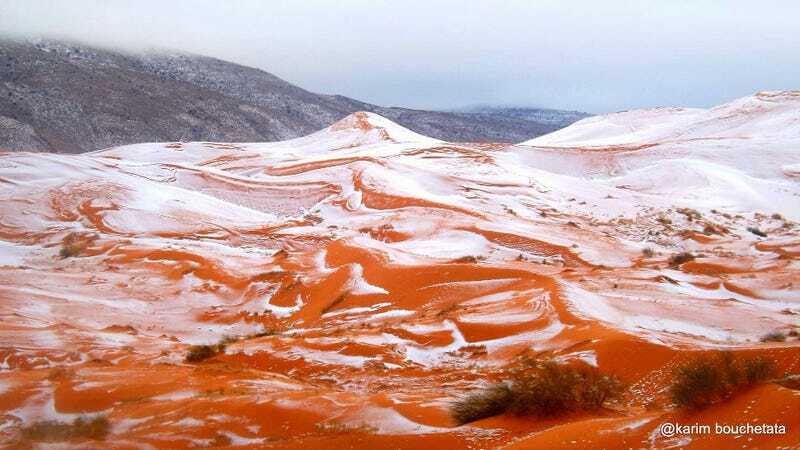 Bouchetata said the snow looked amazing at it settled onto the bright orange sand dunes, creating a perfect opportunity to take some photos. The snow only lasted for one day, and has since melted away. All photos courtesy Karim Bouchetata. You can see more of his photographs here.